Hovers about in its bubble. This pet is redeemed through the common 'Bloat the Bubble Fish' loot card from the World of Warcraft Throne of the Tides TCG expansion. The card may be scratched to reveal a code allowing access to this pet. The code may be redeemed at Blizzard's promotion retrieval page. The pet may be obtained in-game from Landro Longshot in Booty Bay. 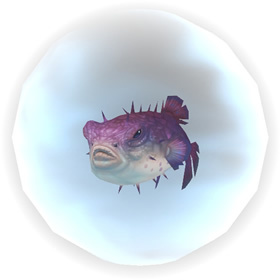 The Purple Puffer has a unique summoning animation in which the player's hands are enveloped with globes of water, and a splashing animation and noise is made upon the pet's spawning. Blasts the enemy with a spray of water, dealing 394 Aquatic damage. Rushes to the enemy on a stream of water, dealing 295 Aquatic damage. Restores 591 health to the user. In two rounds, the opponent's pet will take 591 Aquatic damage and be rooted for 2 rounds. First use: Increases your damage dealt by 10%. Second use: Blasts the target with a surge of water, dealing 886 Aquatic damage. Just in case no one said it: Surge will stop the other player from getting that possible extra hit off on you if they have a faster benefited move. It can be the saving grace vs fliers some times when you are waiting to use pump on them. I won mine from a contest on Wowhead a couple of years ago. Looking forward to leveling him up. I feel like this pet is highly underrated in battle. One of my favorites to use from the aquatics, very strong. This is a pet I have been trying to buy on the AH! It would be an awesome addition to PvE and I think PvP as well. If you find this on AH get it! 325 power aquatic with excellent moveset. Only thing it is missing is some avoidance, but you get a heal instead. Pump hit VERY hard, especially on elementals. And Surge hits for alot as well when you add 10% bonus from Pump. Pair it with a Cleansing Rain user or a Jademist Dancer and your moves will be boosted even further, +25%. Hard hitter with versatility in going first or not. One of the strongest aquatic pets in the game. Just solod Farmer Nishi in valley of the four winds. 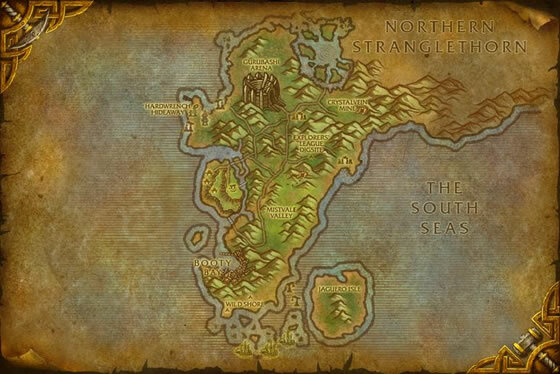 Yes it works with Pandaria... just enter the code at the wow tcgloot.com site and fill in the appropriate info.. its pretty self explanitory once you find the site. Hi Yáll i'm new to this and just wanted to ask if this pet will work with WOW pandaria ? ? ? have not bought a traqde card yet so how does this work ? ? ? ? What a cutie, on my list! Good luck everyone and Happy New Year!! He is a really nice battle pet vs elementals. His power/power breed 4 really makes for a nice heal and good damage as well. I agree with the other reviews... I was excited to get this pet but the bubble is so dark that I cant even see him in there unless I really look. :/ The swirling blue and white specks are so distracting it really just looks more like a pet bubble. It would be way cooler with the fish, possibly a tiny bit larger, and a slower spinning/undulating clearish orb. Bubbles are clear! But I'm with you guys, dissapointed that there is no *puffing* idle animation, and the bubble is too *solid* to really see the little guy. Fish on a leash - soo cute and funny! I love it! Two major downsides - No idle animation, but I can deal with that - but the almost transparent but not transparent enough bubble? You have to look hard even realize what you are looking at. Hopefully Blizzard makes the bubble a lot more bubble-like so we can see our little friends. Adorable, but I am a little disappointed it has no idle. I was kinda hoping for at least an occasional PUFF! or blowing bubbles or something. Ahh well. You might think this fish out of water would be a weak opponent... until you see the intensity that lies within its protective bubble.